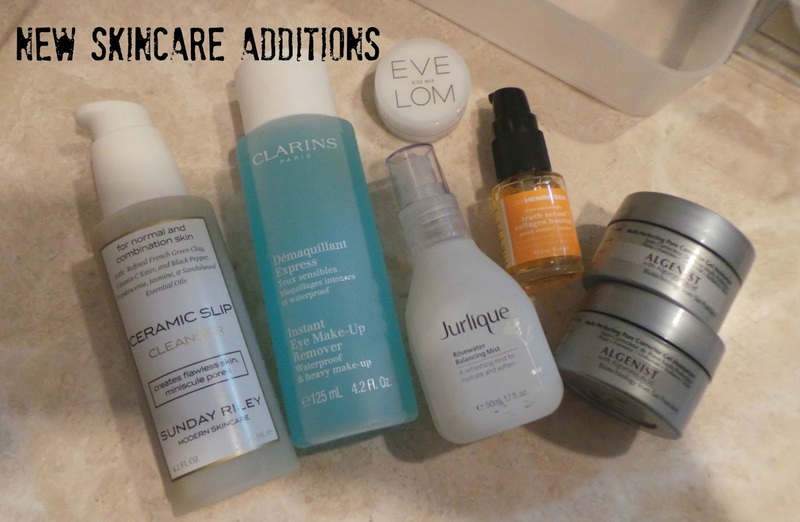 I had a lot of skincare empties last month which was a shame as my skin was really enjoying the combination I was putting on it! In the true spirit of shopping my stash here is what I have pulled out to replace them and my initial thoughts. When Caroline Hirons wrote about this, stocks flew off the shelves and I was on a wait list with Space NK for it. Its a clay based cleanser but with a very light texture-it's nothing like the Ren Clearcalm cleanser (which I thought might be a cheaper dupe for this) which is also clay based and much thicker and heavier. I have been using this cleanser in the morning, massaging it into damp skin as per the instructions. It has a runny gel consistency and doesn't really foam on the skin, but washes off very easily leaving no residue. It contains a cocktail of vitamins, minerals & essential oils to tone & balance normal to combination skin. French Green Clay draws out impurities while Vitamin C reduces the appearance of discolouration & stimulates collagen production for a plumper, dewy complexion. Black Pepper promotes circulation, Sandalwood combats areas of sensitivity, Jasmine soothes & restores while Frankincense encourages healthy cell growth for firmer, porcelain-smooth skin. Pretty strong claims for a product I wash my face with for about 30 seconds in the morning!! I do like it though. I've been using it for about 10 days now and my skin has been very clear and hydrated. Whether I like it enough to repurchase at £35 I am not sure, time will tell! And I definitely don't have doll like porcelain skin (yet). This has to be the mother of all high end eye make up removers. Wowzers it is so effective. You need a tiny bit to get every last scrap of mascara and eyeshadow off and although its bi-phase (oil and water) it's nowhere near as greasy as Lancome Bi Facil which is what I previously considered to be the best high end remover. It's love. I am glad I bought two. Retailing at £18 a bottle it is a high end treat but I will stress you need a tiny bit. I am a massive fan of the Garnier Soothing Two in One Make Up Remover which is the same concept but a hell of a lot cheaper and I will probably end up going back to that. But this one has some more refined ingredients such as rosewater and camomile meaning it's gentler on the delicate eye area. I feel like so far I have been gushing about these new additions and the gush continues!! I mentioned in my last skincare post that I wasn't enjoying using Serozinc as much as I had before but that's purely because it's a very 'functional' and practical hydrating toner. It's not luxurious and doesn't feel pampering and doesn't smell nice but it very much does what it says on the tin. This is the first product I have tried from Jurlique and it came in a Selfridges beauty box from last year. When my Serozinc ran out, this is what I replaced it with and I have been so in love with it. The toner comes in a heavy frosted glass bottle so looks pretty swish and has a very fine but powerful spray-similar to Caudalie Beauty Elixir. If I didn't get a luxurious and pampering feel from Serozinc I get it in bucketloads from this toner. It smells divine when you spray it-sweet and rosy and uplifting. It's delicious. It dries almost instantly and leaves skin toned and hydrated for my serum application. It contains extract of rose and aloe vera, marshmallow and glycerin-all very soothing. I foresee a definite repurchase. Another new brand to me, I think I must have picked this up in New York this time last year and as you can see it's a little sample bottle. This serum is packed with 'daily vitamins for your face'. The ingredients list is impressive-a hefty dose of Vitamin C to help smooth lines and fight further damage, grapefruit and orange to brighten and detoxify, rosehip and Vitamin E to nourish and protect. It's contains no nasties like mineral oil or parabens. The serum feels as light as water and does not have an oily residue, making it perfect for the morning. It absorbs instantly, my skin literally drinks it up and provides a great base for moisturiser. I've been using this for a couple of weeks and my skin is really clear so I'd be interested to see the longer term benefits of this. I do however have other Vitamin C laced products in my stash so will be using those up before repurchasing. 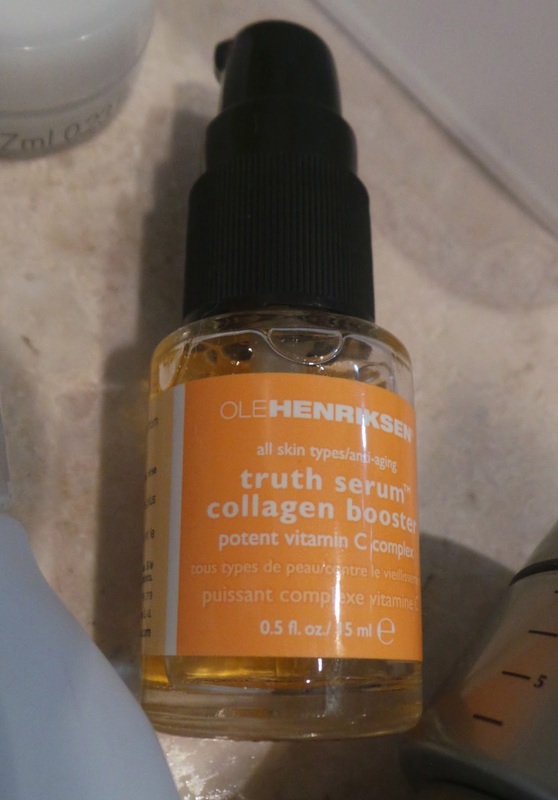 One last thing-this serum smells amazing. Ok so I am realising I actually like all of the products in this post!! This was also part of the Selfridges Beauty Box from last year I mentioned earlier and is a lip balm. I wear lip balm every single day, it's what I would take to a desert island. 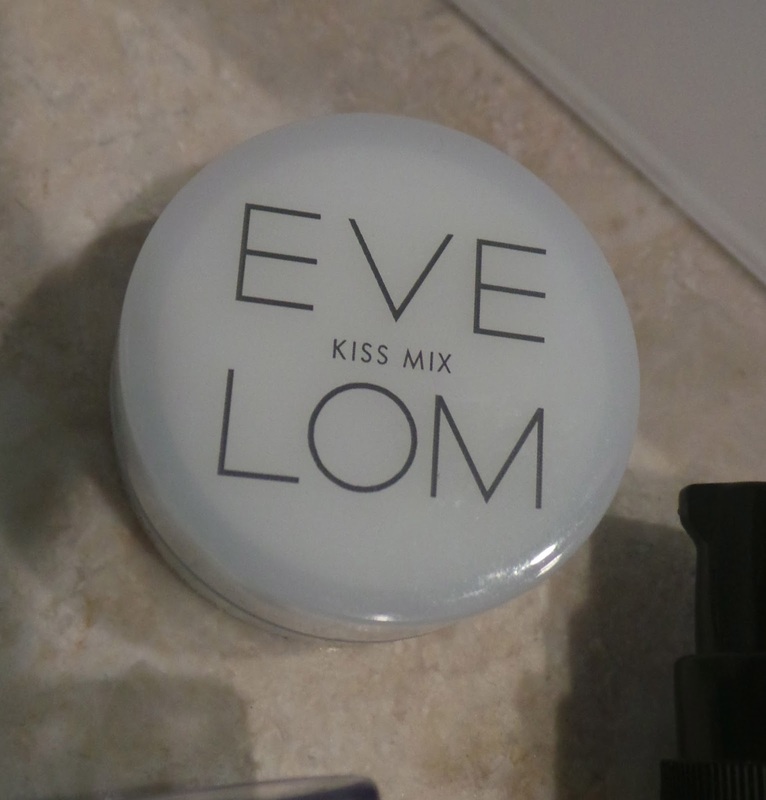 This Eve Lom balm is very firm in texture (it's not a soft vaseline type texture) and comes in a handy pot which I keep on the bedside table. I'm not a big fan of dipping my fingers into things but for lip balm I make an exception. The packaging is very minimal and understated meaning it's suitable for chapped lipped boys and girls. It's not sticky or greasy and leaves a minty tingle on your lips. Menthol and beeswax are the main two ingredients. It works, it keeps my lips hydrated and flake free. I wouldn't say I love it but I will certainly use and enjoy it before fickley going to the next lip balm! 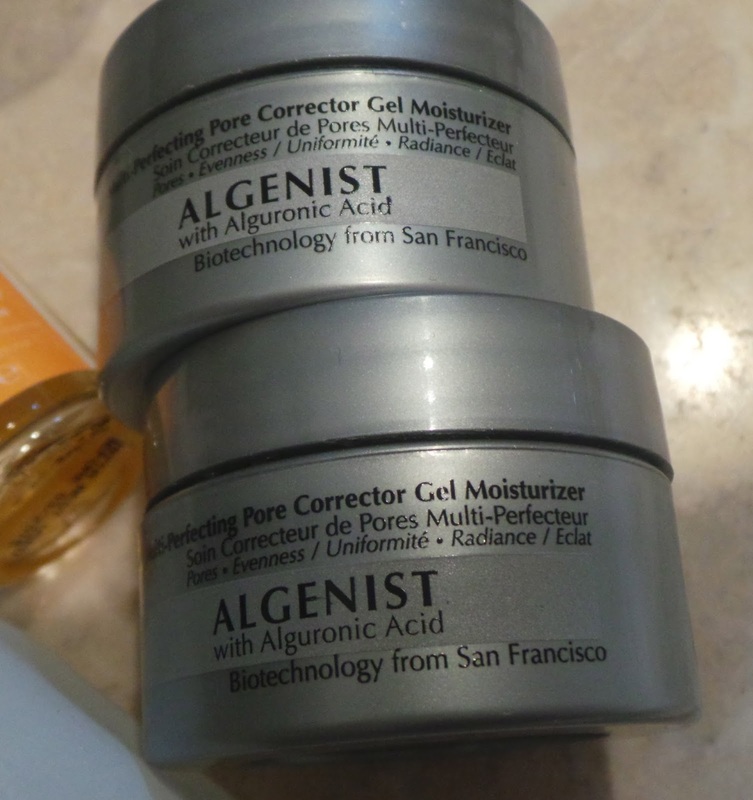 Last up is this Algenist moisturiser which was a gift with purchase from Space NK (I have been really trying to shop my sample stash as I have so many!!). I have two 15 ml size samples so good sizes to get a reasonable feeling of the moisturiser. And I love it. This would be the perfect summer moisturiser-it's light and cooling on the skin and dries instantly meaning you can apply make up straight away. I know you can't 'close pores' but I feel like my make up sits better and my pores show through less since I have been using this. It also contains salicylic acid to promote clear and brightened skin and I have been really impressed. One word of warning though-silicone based primers on top of this moisturiser tend to break down and form little balls on the skin. This is yet another new brand to me and is sold in Space NK-I suspect I will be checking out more of the range when I am next in the UK. I feel like all of this products deserve glowing school reports and I am happy they have found their way out of my stash and onto my skin!! Hello gorgeous girl. I find I need less of the Clarins remover to do the job compared to the Lancome one so give it a go-maybe you can pick it up at Luton duty free-surely they have a Clarins counter at least??? I love the look of the mist and the serum - alot of people are recommending using natural based oil/serums for bed rather than moisturiser - will give this one a look aswell I think!